Well, here’s to another night of unashamed folking. At the Morley United Services Club, there was beer (and beards) in abundance (it is a folk night after all). It was a difficult one for all the Aveyard girls. Since Dad’s passing, it has been very difficult for us all, and it doesn’t seem to be getting much better. This was the third memorial night now and we still aren’t quite sure what to expect when we walk in. A picture of Dad with a couple of candles next to it, and we knew we were in the right place. In the end, this night felt a little different to the rest. This was mostly because of the songs that most of the acts chose to sing, and even the way they chose to introduce them. The night kicked off with Alan and Keith, as it always does. This being the first time I had returned to Morley Folk since the passing of Dad, this felt the perfect way to start the night. Next was Paul Mason. Dad and I had been seeing Paul at Ossett folk club almost every week for a year, at which he played beautiful instrumental pieces. Then, after over a year, to our surprise, we saw him play AND SING at a session in Pudsey. Dad and I both tried to encourage him to sing more, to much backlash of ‘I’m not a singer’ and ‘leave me alone, ya bastids’ (okay maybe not the last one, but you get the picture). So, when Paul introduced a song as ‘the first one he ever heard Pete sing, with his capo somewhere in the stratosphere, as was often the case when singing with Beth’ it seemed to set a precedence for the rest of the night. With the imagery of Pete, sat in the corner at Ossett folk club, Paul slipped into ‘I Once Loved a Lass’. The song was a staple for Badly Strung gigs, and a song Dad played well before we even formed ‘the band’. Many seemed concerned how hearing a song Dad was well known for playing might affect us, all of us. The fact is, it had every probability of reducing us to shaking, crying messes. Okay, yes, we did cry, a lot. The consensus after was that it was so, so comforting. To hear those songs that we had heard over and over in our childhood. 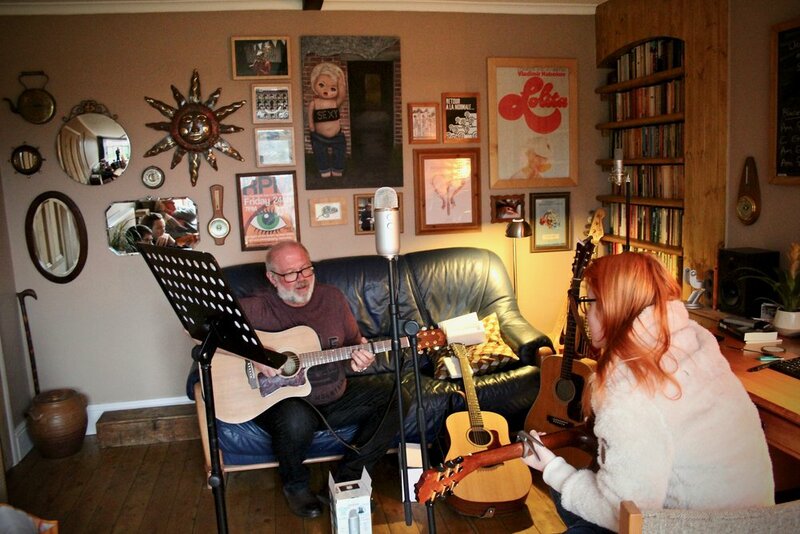 To know that Dad was such a big influence and made such a lasting impression on people, that these songs were no longer just links to our wonderful childhood memories, but now very strong links to other’s memories of Dad, felt an incredibly moving and beautiful thing. The man that meant so much to everyone else, and was so loved, we were blessed enough to be loved by him. This theme continued with Will Nicholson taking the stage and singing ‘The Plainsman’. Again a song that featured in every one of the Badly Strung’s sets, and will always ring through the halls of our childhood. For Kootch, the song ‘Jock Stewart’ suited the theme. Not a song that Pete sang, but a last verse and a chorus that for us, sums Pete up perfectly. The many many nights he had led people astray by buying them drinks ‘so, fill up your cup with brandy or wine, and whatever the price I will pay’. Pete was a very lovely, funny and soft guy, and this only seemed to be amplified when he drank ‘so, be easy and free, when you’re drinking with me, I’m a man you’ll not meet everyday’. Then the break. Money for raffle tickets was added to the money on the door, to be given to Pete’s Just Giving page. Even the prizes were suitable - wine, scotch and folk CD’s. Soapstone Dragon kicked off the second half. Amazing harmonies coupled with amazing voices. ‘Shelling Peas’ certainly felt the song for Pete. Reducing me to a puddle of hot tears, it is a song that was written by Cein after the passing of her partner, Nigel. The refrain of ‘all this time, and I couldn’t make you stay’ is still stuck in our heads now, and still brings a tear to the eye. The song makes references to Cein’s house ‘watching sheep from the back yard’ and reminds us so much of many a party we (and Pete) enjoyed at the ‘farm’ in the middle of nowhere. Nigel Parsons next and the song of choice was ‘Cloud Factory’. Although, ‘New Years Resolutions’ was also a favourite of Dad's, as the fantastic intro to each verse is enough to make your fingers bleed just hearing it. It seemed more poignant that the first time Pete sang ‘Cloud Factory’ was at Ossett, just after his mother had died. For the first time ever (and he won’t like us telling you this) he was so nervous that he wouldn’t make it through the song, he sat with the words in front of him. His hands shook as he played the first verse and by the end, he had to lift his glasses and quickly wipe away tears. ‘My father taught me how to sing, taught me dreams are everything, can’t be bought and can’t be sold, more than silver more than gold’ and my god, there couldn’t be a more accurate chorus for Pete and his girls. Finally, Blackwater took to the stage. With harmonies (and guitars) that Pete aways envied. ‘Four Seasons in One Day’ a particular favourite of ours. After listening to the words ’You can take me where you will, up the creek and through the mill’ seemed to work well. Pete always seemed laid back and would shrug in the face of difficulty… So long as he had his guitar to play! Then, we all got back on stage to sing ‘Wild Mountain Thyme’ together. A song Pete always finished his sets with (also, a song played at his funeral, to commemorate that his gig was over). Everybody had a story of Pete, or a song to sing for him. Everyone raised a massive £789.25 in his name. He would never have believed that anyone would go to so much effort to remember him, or that five months down the line, people would still have stories to share and songs to sing for him. Kootch are extremely blessed to have had his support and guidance, and even more so to have felt the warmth of his love, his laughter and his music. Thank you Pete, without you, neither of us would be here now. We owe you everything. Live as Pete would have wanted you to, with a song in your heart and a guitar in your hand. And if it has to be a banjo, play it quietly, or better yet, somewhere else. WARNING ⚠️ : When looking through our pictures, be not afraid! 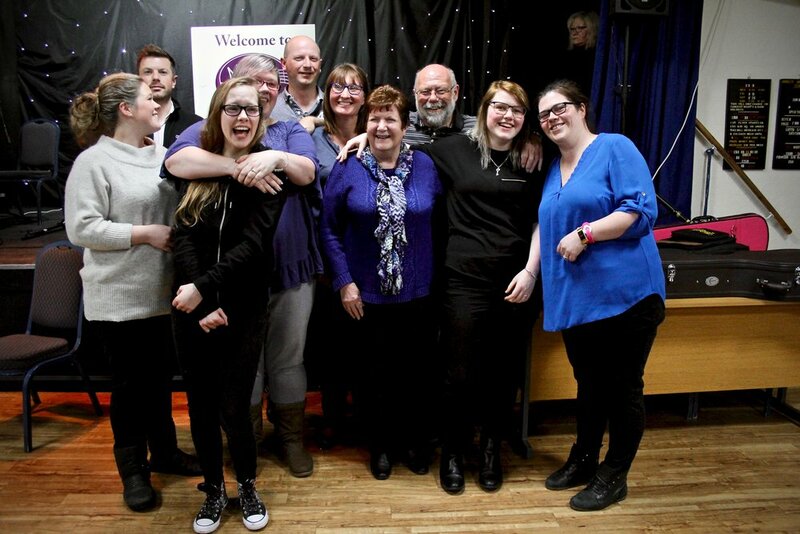 There is a group family picture and the man at the back is not Dad, letting us all know it was a joke, but in fact, Uncle Jim, Dad’s older brother! A picture from before we knew Pete was sick. He often came round to practice, show off a new guitar, and give us general advice and guidance, not just in music, but in life.